How Can We Make Middle School Less Awful? Everyone hates middle school. But this crucial, oft-ignored part of your children’s education is getting a makeover. If this kind of frank, organized discussion of feelings sounds odd for middle schoolers, it is. But, experts say, if middle schools can give as much attention to emotions and values as they give to academics, the double focus pays off in surprising ways. Unfortunately, when it comes to our national conversation about what makes great schools, middle schools (which can serve any configuration of grades five through nine) and junior highs (usually grades seven, eight, and nine) are often like the overlooked middle child. Elementary school is crucial, the reasoning goes, because its students learn basic skills and are introduced to the rigors and challenges of a school environment. As the gateway to either college or dropping out, high school is obviously high-stakes. But there’s another reason we don’t look very closely at how we educate our tweens and young teens. “Adults don’t like to look back on those years,” says Deborah Kasak, the executive director of the National Forum to Accelerate Middle-Grades Reform. We know what she means. Elizabeth is mortified to remember that she became a mean girl who egged on a friend to put glue in an unpopular classmate’s hair. Josh was a prime target for bullies; he has sent his own sons to K-six and seven-12 schools, thus avoiding the middle school experience as much as possible. Whatever the reason, Balfanz says that giving the middle grades short shrift is a serious mistake. “Middle School is when kids make a decision if school is for them or is something to be endured,” he says. In fact, his research of high-poverty schools shows that a sixth-grader who either chronically skips school, fails math or English, or receives a poor final behavior grade has a 75 percent chance of dropping out of high school unless the school steps in to help. On the flip side, ninth-graders who don’t get in trouble, have strong attendance, and at least a B average make up the ranks of our state university systems. 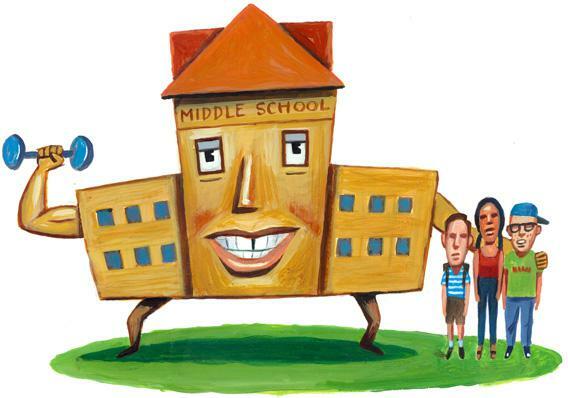 What makes a great middle school? The National Forum’s Schools to Watch Initiative identifies four key traits: academic excellence; an awareness of and sensitivity toward the unique developmental needs of early adolescents; a shared vision; and they capitalize on early adolescents’ obsession with fairness by being a trustworthy and democratic community where every student feels a connection to at least one adult in the building. 1. Respect the environment, yourself, and the community. 2. Cooperate: Teamwork makes the dream work. 3. Support each other even when the odds are against us. 4. Be yourself, do what you love, and try! 5. Be resilient: Fall 7 times, stand up 8. When students do something—clogging a toilet, perhaps?—that falls outside these principles, middle school principal Nancy Cresser sits down with them and asks which one they think they’ve transgressed. “They know exactly which ones they’ve violated and they figure out how to fix it,” she says. Instead of storming off or pouting about the unfairness of the rules, Cresser says that Paul Cuffee students are OK with being held accountable. They’re the ones who created the rules, after all. So the students in question come up with a plan to fix what happened. The school encourages positive behavior by offering “chicken points” to any student who is caught doing a random act of kindness without the thought of being rewarded. The classroom with the most chicken points after a month or two gets a prize that they determine—throwing a pizza party or not having to wear their uniforms for a day. While all this emphasis on students’ feelings and responsibility might feel like yet another education gimmick, a growing number of experts agree that prioritizing middle schoolers’ sometimes volatile and often mysterious emotional needs is at the heart of how we can best educate our 11- to 14-year-olds. A literature review published this year by The University of Chicago Consortium on Chicago School Research finds that while middle schoolers are developmentally ready to do challenging work, they can’t always do so unless schools also build up their sense of what they think is possible for themselves. At Paul Cuffee, it works. In 2010, 70 percent of Paul Cuffee’s middle school students—mostly from low-income families—were proficient in the New England Common Assessment System (NECAP) reading test. Fifty-nine percent of students were proficient in math. Across town on the wealthier east side near Brown University, the Nathan Bishop Middle School’s scores were 42 percent proficiency in reading and 32 percent proficiency in math. Creating these kinds of schools can be a challenge, according to Balfanz, not only because very few teachers go into the profession wanting to specialize in middle school. Training for programs such as Developmental Designs that create a culture like the Paul Cuffee School is extensive and expensive and requires a school’s entire staff to participate and change their attitude to truly believe that intrinsic motivation is more effective than extrinsic punishment—otherwise known as old school.